US-backed incumbent Hamid Karzai was today officially declared winner of Afghanistan’s first presidential election, almost a month after eight million Afghans defied threats of violence to have their first say in their country’s leadership. Notorious serial killer Charles Sobhraj, who is serving life sentence in a Kathmandu jail, has made an attempt to escape, but the police today claimed to have foiled it by unearthing an e-mail sent from his laptop asking a friend to help drug prison guards. World leaders today mourned the demise of Sheikh Zayed bin Sultan al-Nahayan, the founding father and President of the United Arab Emirates, terming his death as an "irreplaceable loss." West Asians, people, with the exception of Israelis and some Iranians, reacted with resigned disappointment today to the US election results expected to give President George W. Bush four more years in power. A rmed police operations have been postponed as up to 120 of the 400 specialist officers in the Metropolitan's SO19 firearms unit have threatened to hand in their certificates that allow them to carry guns. Gurinder Chadha, NRI director of Aishwarya Rai-starrer “Bride and Prejudice”, has been honoured at the House of Commons for her outstanding achievement and contribution to the British film industry. Musharraf says a Kashmir solution humiliating either country not acceptable. “Karzai is the winner,” the UN-Afghan Joint Electoral Commission’s spokesman Sultan Baheen said after the findings of a fraud probe concluded that “shortcomings” did not affect the poll’s outcome. But Karzai would not be present for the declaration of his victory, as he has flown to Dubai to attend the funeral of United Arab Emirates President Sheikh Zayed bin Sultan al-Nahayan. The drawn-out vote count was only completed last Thursday. Preliminary results gave Karzai a landslide win of 55.4 per cent with a 39.1 point lead over his nearest rival, former Education Minister Yunus Qanooni. Qanooni was not immediately available for comment. The favourite of the powerful anti-Taliban Northern Alliance, Qanooni preferred to wait until the results were publicly certified and may hold a press conference later, his spokesman Hamed Noori said. The panel was set up by the UN after 14 of the 18 candidates threatened to boycott the election in the middle of voting on October 9 over alleged irregularities, mainly arising from the failure and mix-up of indelible ink, which was meant to stain voters’ fingers to prevent repeat voting. Panel member Craig Jenness, a former Canadian diplomat, said Afghans deserved to be proud of their first election. Authorities seized the laptop, a mobile phone and a cordless phone from the prison cell of Sobhraj, known as "the serpent", and discovered the mail asking for some specific chemicals to drug the prison guards, spokesman of the Nepal police Ramesh Singh said today. The criminal, known for his talent for disguise and escape, had given a list of chemicals that could make people unconscious and sought arrangements for taking him to India and then to France, a police official said. 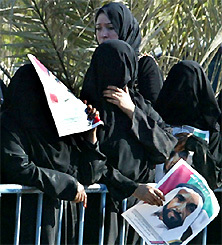 Women wait for the funeral procession of Sheikh Zayed bin Sultan al-Nahayan, at al Musafa in Abu Dhabi on Wednesday. In Beirut, Lebanese President Emile Lahoud expressed his "deep sadness" at the passing of Sheikh Zayed, saying it was a "loss for his people, for Lebanon, for the Arab states and for the entire world." "Lebanon, which occupied a special place in the heart and the spirit of Sheikh Zayed, is today full of sadness because the UAE leader was always a supporter and fierce defender of its rights, notably over the Israeli occupation of southern Lebanon," he said in a statement. German Chancellor Gerhard Schroeder mourned the death of Sheikh, saying he was a towering leader in the Arab and Islamic world. "The late President will be remembered for his efforts to unify and strengthen his country, turning it into one of the most remarkable nations in the world. With the demise of Sheikh Zayeed the world has lost one of the symbols of heroism," he said. Egyptian President Hosni Mubarak called Sheikh Zayed "a very dear friend, a leader and the best of men" and announced a three-day state mourning. One consolation for them was that few had high hopes from Democratic challenger John Kerry, who attacked the way Bush had handled the occupation of Iraq but did not promise action Arabs wanted to see on the Israeli-Palestinian conflict. Many said they feared another four years of Bush would bring more conflict and bloodshed to the West Asia. A few said Bush was preferable because he now knew the region and would have time to adjust his policies, or because of his campaign for political reform in the Arab world. “Four more years means he will be relentless in fighting so-called terrorism. More innocent persons will be victims. Unless he has more sober people around him I don’t know what is going to happen,” added Khaled Maeena, Editor in Chief of the Saudi newspaper Arab News. “All Saudis I've seen so far are disappointed. We spoke to more than 30 persons. They are disappointed that Bush has been awarded victory,” Maeena added. The only immediate official comment came from Yemen, which has cooperated with Washington against the militant Islamists despite its reservations about overall US policy. Yemeni Foreign Minister Abubakr al-Qirbi said his country would continue to cooperate “no matter who wins”. The Bush administration has brought America’s standing to record lows among Arabs, mainly because of its invasion of Iraq and perceived neglect of the Palestinian problem. Even his campaign for reform and democracy in West Asia had not been well received because of suspicions that it was an attempt to impose US interests in the region. There were pockets of pro-Bush sentiment in Israel, the closest US ally in the region, and paradoxically in Iran despite quarter of a century of frigid relations. Armed police operations have been postponed as up to 120 of the 400 specialist officers in the Metropolitan's SO19 firearms unit have threatened to hand in their certificates that allow them to carry guns. So far at least 80 officers have refused to continue their firearms duties. Some armed officers in the specialist units SO14 and SO16, which protect the Royal Family, Westminster, Downing Street and visiting heads of state are also understood to be considering leaving their positions. The protest was sparked by the suspension of two SO19 officers after a fatal shooting. Inspector Neil Sharman and P.C. Kevin Fagan could face criminal charges after a second inquest into the death of Harry Stanley (46) last week for unlawful killing five years after his death. The two officers said they thought he was pointing a shotgun at them but in fact he was carrying a table leg. Sir John Stevens, the Commissioner of the Metropolitan Police, and Assistant Commissioner David Veness, who is in overall charge of security, held separate emergency talks with the disgruntled officers yesterday amid fears that the protest could escalate and leave London undefended. The SO19 include the officers who operate armed response cars to shootings and other dangerous emergencies. Sir John said: "It is a very serious situation indeed. It is spreading. At present we have had a large number of officers who have handed their tickets in." "They are not prepared to carry guns at present considering the decision made in the coroner's court I want to make absolutely clear that I have sympathy for officers who have to make a split second decision in light of threatening circumstances." He continued. "We need these officers in London to ensure that Londoners and officers are safe", he added. "We have a very serious problem at the moment......it is escalating." Sir John said he would also meet with the two suspended officers. Glen Smyth, chairman of the Metropolitan Police Federation, said the decision to suspend the officers had provoked "anger and disquiet" in the ranks. Describing her hit film “Bend It Like Beckham” as the biggest British-financed and distributed film, Keith Vaz, MP, and former Minister for Foreign and Commonwealth Office, said last night it was impossible to quantify the achievements of Gurinder Chadha. "Her hit film “Bend It Like Beckham” is the biggest British-financed and distributed film and “Bride and Prejudice” is the No.1 in the box office chart in Britain,” he said at a reception hosted in her honour by himself and two other MPs John Barrett and Michael Fabricant along with the ROKO Cancer Appeal headed by A.P.S. 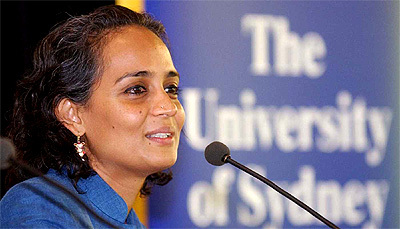 Chawla. "Gurinder Chadha has made a fantastic contribution to the British film industry over the past 15 years. She is one of those rare British film-makers who has won artistic and popular acclaim from all over the world." Chadha, who was emotionally moved, said it was for the first time a film director was honoured at the House of Commons "in this way." time to get a job because he had a turban and beard”.